Presented here, a very rare piece of early lighting, possibly one of a kind and made by special order. It is circa 1750-75 and is in fine original condition, showing only minor surface rust and normal wear due to age and usage. It measures about 20-1/2" high to the tip of the center spike and is 8-1/2" in diameter at the bottom. It stands on three feet and holds 6 candles . 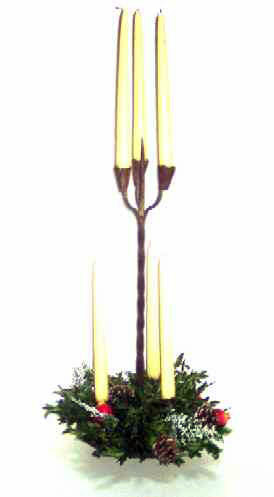 . . three on each level and the center spike could accomodate a larger candle. This is a very unusual candleholder and would be gorgeous decorated with greens or boxwood as I've done here. This one will be very, very hard to part with!